POLICE have interviewed two teenage boys after a narrowboat was deliberately set alight. 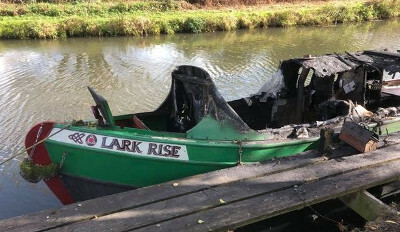 The narrowboat, Lark Rise was moored on the River Wey at Godalming when it was set alight last Friday during the afternoon, being completely destroyed, Alan Tilbury reports. The boat was moored at a jetty at Godalming Wharf, opposite Sainsbury's, with the emergency services called but the boat was quickly engulfed in flames and suffered substantial damage, though there were no injuries as the boat was unoccupied at the time. The investigation by police resulted in two 13 years old boys being interviewed under caution, with a report prepared and sent to the local Youth Intervention Team, that will make the decision what action should be taken.